-led bombing of Islamic State. I’d been wondering for some time about a chart for the Islamic State Caliphate, and then I noticed Christina had put up a post on the subject, suggesting a particular chart. Which got me thinking. (NerdWatch: Skip the next 10 paragraphs if you’re not technically minded). 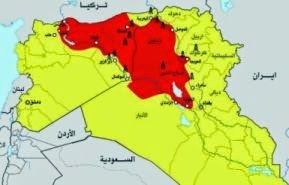 What we know is that the spokesman for IS declared the Caliphate (extending across captured territory in Syria and Iraq) on the first day of Ramadan, 29th June 2014, the Islamic holy month, when Muslims fast from sunrise to sunset. The timing for this declaration, however, is confused. If you look on skyscript, or on Robert Hand's Facebook Page for 3 July, it becomes apparent that there are a number of conflicting reports, some as much as 12 hours apart from each other. Not only that, but there is also youtube evidence of ISIS fighters celebrating the announcement of the Caliphate before sunrise that day! At exactly what point did the Caliphate come into existence? We may never know, indeed there may well not be an exact time. Rather like the USA, did it come into existence on 2nd July, when Congress decided the USA was now independent, or 2 days later when the public declaration occurred? In the same way, did the Caliphate exist once it was announced publicly, or at some point in the previous decision-making process? 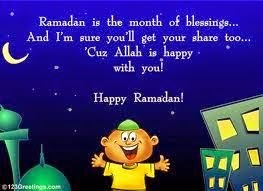 The founding of the Caliphate, however, has one big astrological advantage over the founding of the USA, which is that it was clearly timed to coincide with a powerful symbolic event: the start of Ramadan. Astrology is essentially symbolic, and so I think a strong case exists for the start of Ramadan '14 being a chart that signifies the Caliphate. That is already what the declaration is associated with. In the absence of a clear time for the declaration, this chart could eventually become THE chart for the Caliphate. 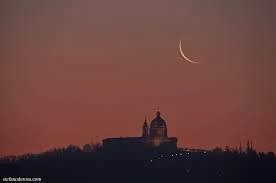 Even though the public declaration was made sometime during the 29th of June, Ramadan begins with the first sighting of the crescent Moon after the New Moon, which was the evening before. So I spent a couple of hours researching the moment at which the crescent Moon would have become visible in Ar-Raqqah, Syria on that date. Some Muslims use the time of the New Moon, which is easily calculable, but that is not so traditional, and IS are nothing if not traditional, as they see it. At Moonsighting, there was a sighting of the Moon from Kuwait at 18:59, 8 minutes after sunset (which was 2 minutes after the Sun dipped below the Descendant on Solar Fire). That was the best info I could get for that area. 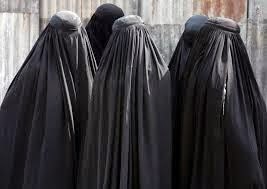 They weren’t able to see it, for example, in Saudi Arabia or Lebanon. So the best possible guess I can make is for 10 minutes after the Sun crossed the Desc in Ar-Raqqah. And that gives this chart. 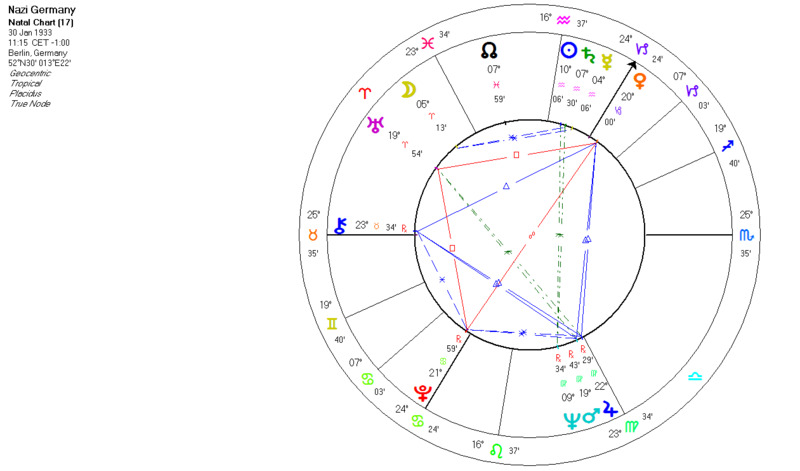 One of the main differences from some other charts is that, crucially, Pluto is in the First House instead of being hidden in the 12th. 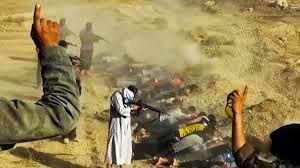 And I think that what has characterised the IS Caliphate from the start is the openness of their brutality and their aspirations to power in the Muslim world. That is more characteristic of a 1st House Pluto. With 12th House Pluto, their real motivations would only have become clear over time, and even then they would be denied. 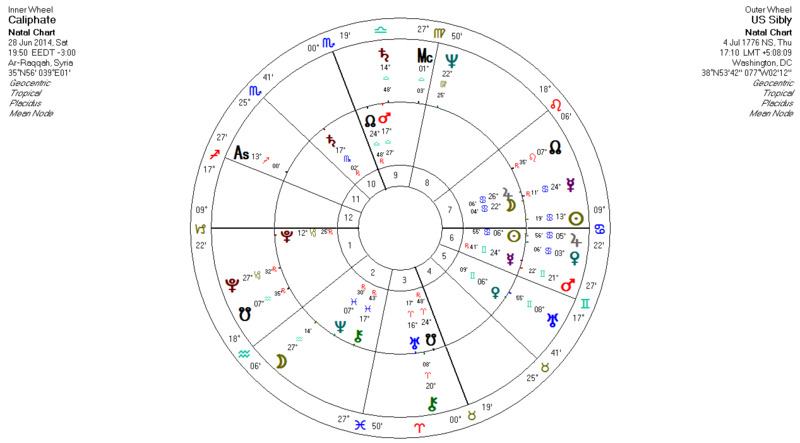 Overall it is a very powerful chart of an emotionally based religious movement (Sun and Moon in Cancer, Moon conjunct Jupiter) creating a homeland (Cancer) that wishes to expand (Jupiter), and willing to be as brutal as necessary to survive (Sun opposite Pluto Rising) in the face of what it sees as a world that is against it (Sun opposite Pluto). And the world that is against it is essentially the US and the other western powers. 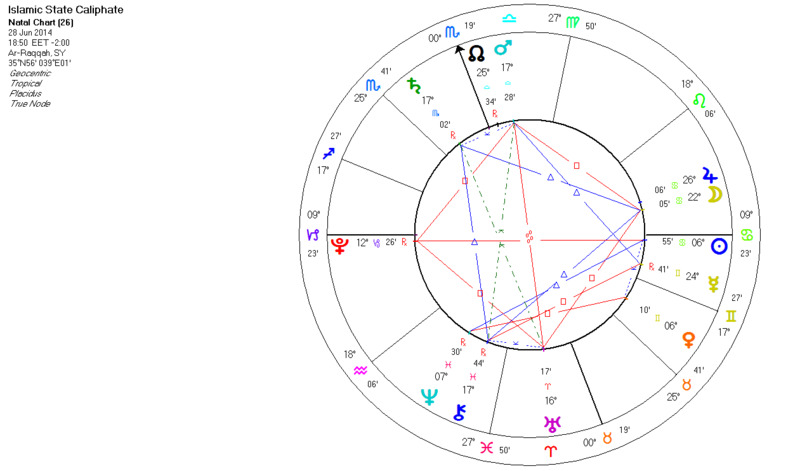 The US has Sun-Jupiter at 13-9 Cancer, conjunct the Caliphate Sun-Desc and opposite its Pluto. This comparison of the two Charts shows very clearly the mutual shadow projection occurring. The 7th House is the House of 'Open Enemies', of mirrors, if you like, each seeing its own brutality in the enemy. Each have major placements in the 7th of the other, and all in the same sign of Cancer, the visceral sign of homeland and patriotism/nationalism. America is the Great Satan once again, while the IS are terrorists, subhumans who commit brutal acts for the sake of it, for no reason. Which has a truth to it, but that's not the point. I wouldn’t want to defend IS at all, but it also involves the old story of the US projecting its own brutality outwards, a need it seems to have. See Oliver Stone's admittedly angled but informative Untold History of the United States. You could argue that IS and its Caliphate are the logical outcome of the US attempts to control the Middle East over many decades, an attempt that continues and which fuels the extremism of IS. The bombings, while maybe producing short term gains, will in the long run only make the situation worse. That is a very powerful connection. There isn't the same mutual 7th House connection that the US has -it only goes one way - so the emphasis on the Caliphate as 'enemy' is less. But overall the connection is stronger. Like it or not, we are locked in to Islamic State, and the fears of Brits flying out there and joining IS, then returning and creating problems at home, are therefore real. I find it fascinating when themes reverberate down the decades, and astrology sometimes reveals this. Britain was involved in the creation of Iraq, an artificial state made up of different peoples, in the 1920s. And the chart for the Caliphate shows that our involvement in the power-politics of the region is just as strong now as it was then. Of course, it's all ultimately about oil. The West does not wage war against Boko Haram (a jihadist Muslim organisation sympathetic to IS) in Nigeria. We only wage war if our vital interests are threatened, and then we claim the war is about something else. And that's what I mean when I talk about each side projecting its brutality on the other. We are bombing IS not because they are awful (which they are) but because they threaten the West's control of a region on which it is dependent for a vital interest. And that is brutal. But it is concealed under fine words, and made remote through distance and technology. IS, however, do no such thing. They execute people and display it all over the internet. It seems self-evident that they are the bad guys and we are not. Mars in the 9th opposite Uranus: the religiously (9th) inspired beheadings (Mars-Uranus), or the beheading of foreigners/journalists (9th). Gruesomely, Aries is associated with the head, and Uranus with sudden separation: Uranus is in Aries. 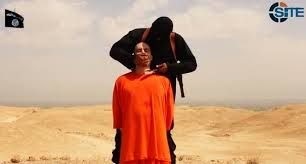 The beheadings began in response to American airstrikes, what is called 'asymmetrical warfare'. Trine from Saturn in Scorpio in the 10th to Moon-Jupiter: there is harmony between the people (Moon) and their rulers (Saturn) suggesting the Caliphate is here to stay and may grow. Sun, Moon and Asc are all Cardinal: Cardinal signs begin events, they initiate, so we have the suggestion of a powerful beginning, that lends strength to the endurance and ambitions of the Saturn. The Caliphate, ridiculed by many Muslims, is likely to permanently change the Islamic world. Cancer, Capricorn and Scorpio are all pronounced in the chart. Cancer and Capricorn are conservative, traditional signs, while Scorpio at its worst involves the exercise of archaic, cruel power, and hangs onto the past for dear life. North Node conjunct Mars in 9th House Libra opposite Uranus: what the IS needs to learn is that others also have a religious/metaphysical viewpoint (9th Libra), instead of imposing their own views, using shocking violence (Mars-Uranus) that puts them outside the human community (Uranus). Venus square Neptune: the women (Venus) are invisible (Neptune). I keep thinking of Nazi Germany when I think of IS, they really do seem to be that bad. The charts don’t have much in common, and you can always find something! Maybe it is WHAT you find that matters. The Nazi Pluto at 21 Cancer conjoins the Caliphate Moon. This suggests the aspect of Nazism that involved the collective (the Moon) giving absolute power to their leaders (Pluto) and doing things under orders that they wouldn’t ordinarily do. There are stories of Brits who've gone to join IS becoming disillusioned, but IS won't let them leave, and in any case they would be treated as criminals in the UK. The Prog Nazi MC-IC is at 15 Aries-Libra. The IS Mars-Uranus runs closely along this axis, as well as conjoining the Nazi natal Uranus. It suggests the shocking violence of the Nazis being born again in IS. Note that in the Nazi Germany chart, Pluto is hidden on the IC, not entirely unlike having it in the 12th (as I said earlier). And Hitler concealed his intentions until they were obvious and for many it was too late, or in the case of the UK, nearly too late. 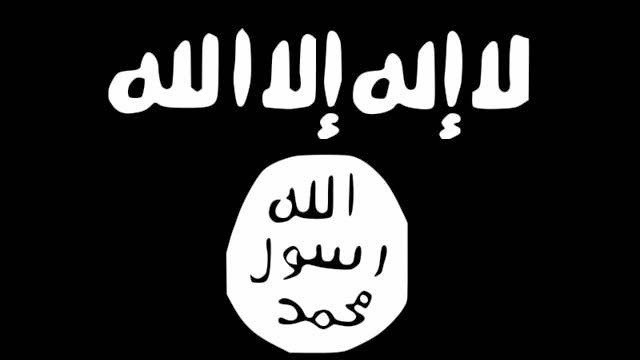 With the Caliphate and its 1st house Pluto, we know from the start what they are about. Your interest in world events and how they play out through the prism of Astrology is fascinating. The above work you have done scares me more than much of what's been written in mainstream media. I live in Australia and our Prime Minister is desparately trying to improve his status with the population so has been pushing hard for participation in this 'war'. I'd be very interested, if you felt so inclined, for your analysis of Australia's chart in relation to IS, US and UK. One small issue: the photograph you show of the crescent moon is the last phase of the old moon before it goes dark. I shoot photos of the moon regularly. The crescent of the new moon faces to the viewer's right. That aside, I have been struck by the timing of current actiosn by ISIL/IS and how this almost seems to resemble the timing of the Crusades, following Pope Urban II's potboiler speech on Nov. 27, 1095. 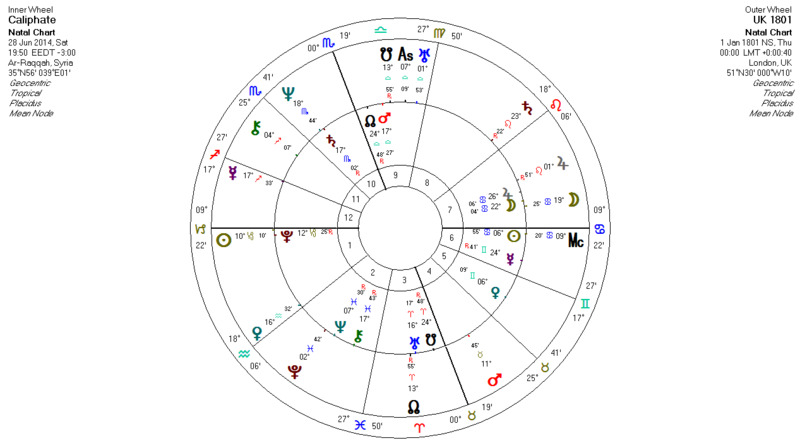 What I see in the IS chart that you presented is a grand square with the Pluto-Mars-Uranus on one side and Mars-Jupiter-Uranus on the other. It was supposed to have an effect on financial markets when it occurred. It is deemed to act as an impediment. My real-world concern is that we may be plunged willy-nilly into a prolonged war that drags on, as the Crusades did for 195 years, but with no resolution to it. I tnink it's a concern for everyone. And what will stop them? Will they be stopped? What will it take to stop the rampage? The basic maths in this is very strong both a grand cross (red square), and a grand trine (blue triangle) these are strong aspects of 3 twelfths and 4 twelfths.. But even the minor (and odder) harmonies of the 5 twelths or quincunx are there (in green) and these are quite accurate and symmetric within the overall pattern....I wonder if any astrologers could say if these leave some strange possibilities open? Some optimism..the symmetrical quincunxs are mars chiron and saturn uranus some healthy evolutions there. I am reminded of the recent discussions of the demogogue who inflamed fear In the place of my birth.. Ian Paisley...when a leader fully embodies the responsibility of that position he can mature beyond the demogogury into sensible exchange. 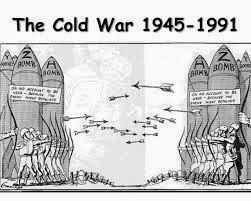 In war we play a zero-sum game. In negotiation we jockey to see who will get the biggest slice of the non-zero sum action. Interesting article, thanks. Couple of comments. I think we should be clear that Isis are ready to be more than hard-hitting out of necessity but brutal for the sake of it, more than actually necessary. Secondly, I think that the UK government probably does want control over the middle east but have not really pushed for it until now and are still not committing us wholeheartedly and there is more to it than just managing oil. I'm sure they do not want terrorist plots succeeding in the UK.